Popular social media management platform HootSuite is providing its users with deeper audience insights, thanks to the company’s acquisition of social analytics solution uberVU. The acquisition aims to combine uverVU’s analytics technology with HootSuite’s social management platform in order to help enterprises better understand audience behavior and create more meaningful social conversations. UberVU’s technology helps businesses identify key influencers, spot real-time spikes in engagement and recognize important mentions. Plus, the platform offers insights on audience sentiment, location and demographics. According to HootSuite, uberVU’s standalone social analytics product is still available. That said, the company will begin integrating uberVU’s technology with HootSuite over the next few months. 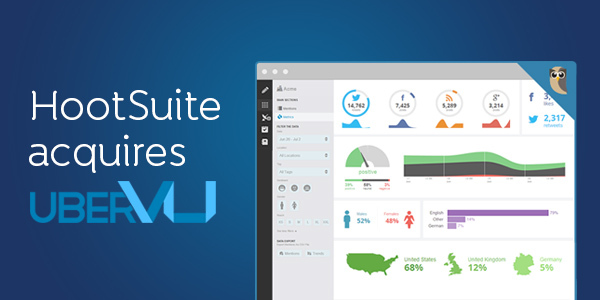 “UberVU represents the next generation of analytics solutions, and brings with it a world class product team,” said Ryan Holmes, CEO of HootSuite. “This acquisition brings together uberVU’s best-in-class analytics with HootSuite’s social engagement solution, getting us one step closer to our vision of a simple, scalable, and secure platform for a rapidly evolving social media landscape." It is also important to note that the acquisition could help HootSuite expand its Enterprise solution, as uberVU’s user base consist of more than 200 enterprise customers, including 3M, NBC, Heinz and Getty Images. Currently, HootSuite states that its Enterprise solution includes 75 percent of Fortune 1000 companies.